Most people just do not realize how much their living and working environment impacts their personal productivity. If you are working out of a messy and cluttered area, you probably waste a total of 30 minutes a day trying to track down files or items that need. Not only does this type of space keep you constantly distracted, but it promotes negative working energy as well. With that being said, you probably hear people say on a daily basis that they just don’t have enough room in their office to get organized, or their office really isn’t designed for their needs. Well, the truth of the matter is that these are just excuses. It doesn’t matter how small or what type of space you are working with there are tons of different innovative ways that you can organize and decorate your home office or the cubicle at your work to increase productivity. Nothing will get you more focused on your work than inspirational reminders. Think about putting up some inspirational quotes or reminders around your working area. It can be easy to get distracted and lose motivation when you are overwhelmed with work or feeling blue, but with inspirational quotes and reminders of your goals and dreams, you will be able to accomplish so much more. It can be incredibly hard to focus on your work if you are freezing to death or sweating bullets. This is not to even mention the effect that this is going to have on your health. This is why it is imperative to make sure that your office stays a desirable temperature year around. 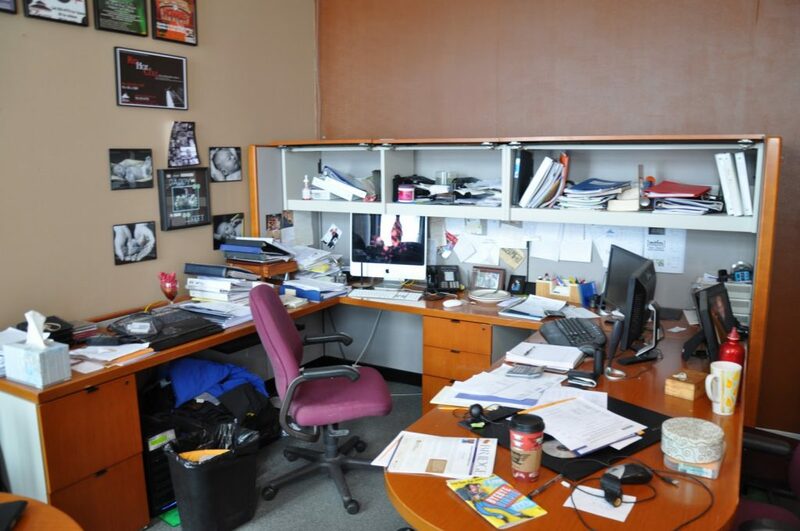 A lot of people have clutter in their office. Initially, this might not seem like a big deal. However, it could cause a huge problem sooner or later. Can you imagine how difficult it would be to find crucial paperwork when your desk is overloaded with trash, papers, and other unnecessary items? You’d be forced to sift through the trash before you’re able to find the paperwork that you need. This could slow you down significantly in the long run. With this in mind, you should remove the clutter from your office. Make sure you can access the documents that you need without too much of a hassle. It is always in your best interest to ensure you’re able to access the items that you need when you need them. This is where labeling can prove to be enormously beneficial. By using labels, you’ll know exactly where everything is at any given time. You’ll know which container holds your bills and which one contains your tax documents. Always use labels! They’ll make your life so much easier and help you save a lot of time as well. Also, if you can keep a soft copy then having a physical copy, for example, the To-DO list, increases the clutter. While you’re at it, you’ll want to make sure that you keep a notebook nearby. A notebook can be very beneficial for numerous purposes. Whenever you receive an email, text message or voicemail, you’ll be able to jot it down in your notebook. It can also be used to keep track of your meetings, schedule, and other vital details. With a journal or notebook, you’ll be able to guarantee that you do not miss any crucial meetings in the future! If they permit you at your work, buy a small plant, maybe a cactus or a succulent and a nicer pot to set up perfect ambiance for work. Watching the plant grow, flower and foliage would be very satisfying, while at the same time giving the space a serenity, if I can say that. Readers, how are you tidying up your working space to increase your productivity?